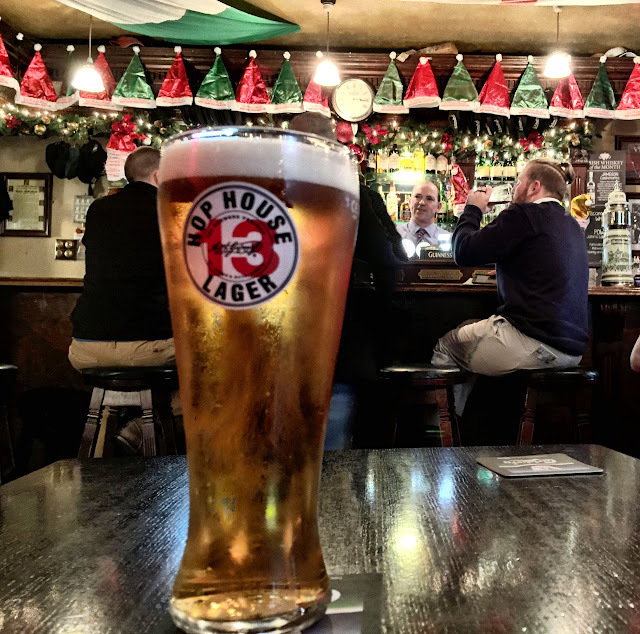 Day 2: Dublin. With our physical resources pretty drained when we went to bed last night, we slept more than 11 hours, waking this morning after 8:45. Refreshed by the extra rest, we ventured downstairs for further sustenance at the Hilton's bountiful breakfast buffet. By 11:15, we had waited out the rain, which had been falling all morning, and we set out on foot to see Dublin. Across the street from our hotel, we stopped by the historic Kilmainham (kil-MAYN-em) Gaol, a former prison that is one of the city's top attractions. Visitors are allowed in only by guided tour and the next tour wasn't available until 1:30. Since it was so close to our hotel, we opted to end our day there and chose the last tour of the day at 4:30. When we tried to pay for our tickets, our money was refused. Admission is free the first Wednesday of every month. Talk about the luck of the Irish! 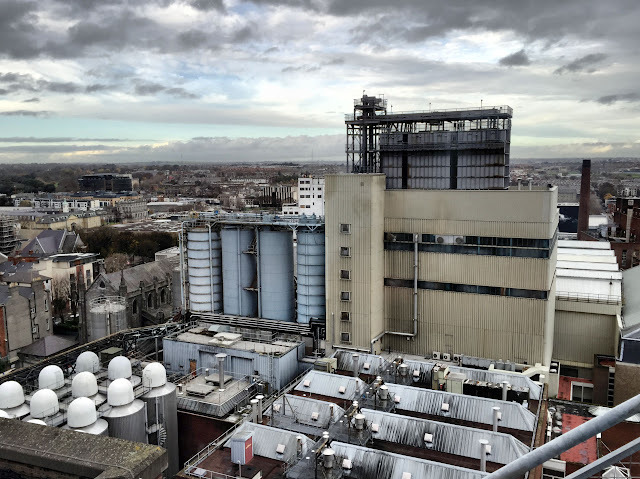 With the end of our day planned, we walked east on Kilmainham Lane toward the city center and our next stop at the Guinness Storehouse, a former fermentation plant transformed into the brewery's seven-story visitor center in 2000. 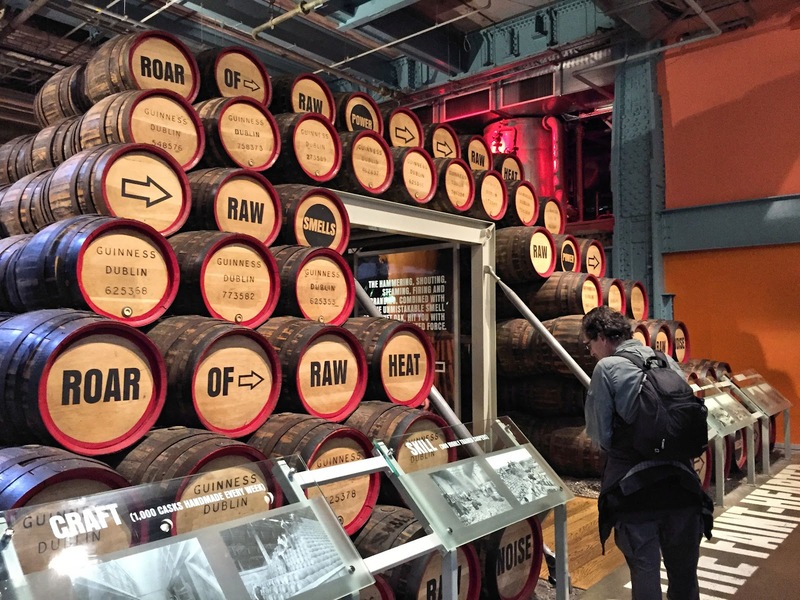 Recently voted a favorite European tourist attraction, the storehouse tells the story and the history of the legendary Irish brewery. 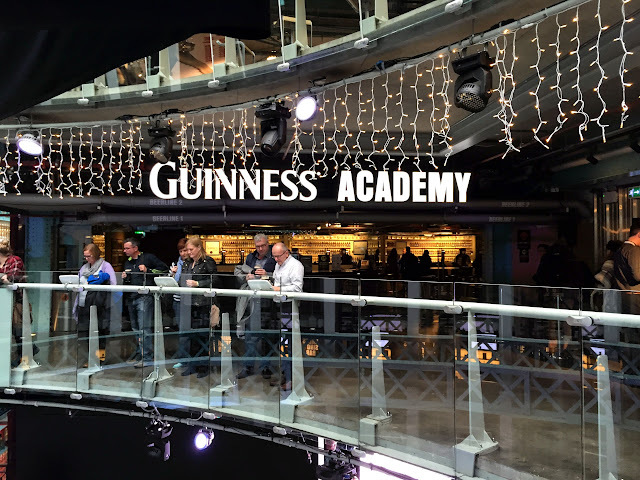 Exhibits are centered around a seven-story glass atrium shaped like a giant pint of Guinness. In what must still remain one of the longest lease terms in history, Arthur Guinness, an experienced brewer, moved to Dublin in 1759 and signed a 9,000-year lease on the unused St. James's Gate brewery and the surrounding four acres for an annual rent of £45. In subsequent years, Guinness purchased the property and an adjacent 50 acres. By 1886, St. James's Gate was the largest brewery in the world. Each step of the brewing process is featured in Storehouse exhibits. 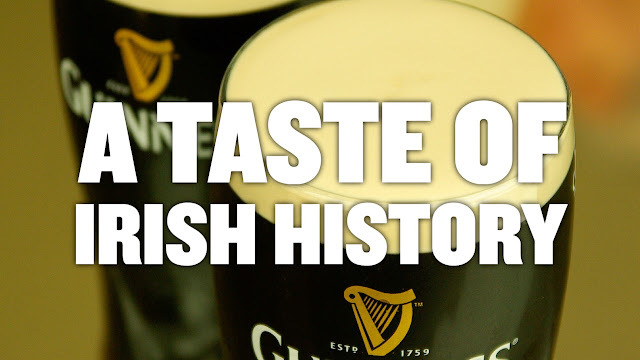 The Guinness harp, which serves as the brand's emblem, is based on a famous 14th century Irish harp known as the Brian Boru Harp, which is preserved in the Library of Trinity College in Dublin. Featured on the label of the first beer Guinness bottled in 1862, the image was registered as a company trademark in 1876. This famous Irish harp was also selected as an official symbol of the Republic of Ireland when it was founded in 1922. 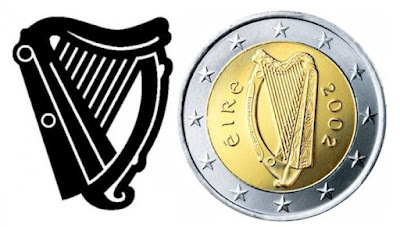 Because of the Guinness trademark with the straight edge of the harp on the left, the government had to reverse the image of the harp, putting the curved edge on the left. Of course, a favorite part of the storehouse self-guided tour is the "free" pint of Guinness that's included in the admission cost. 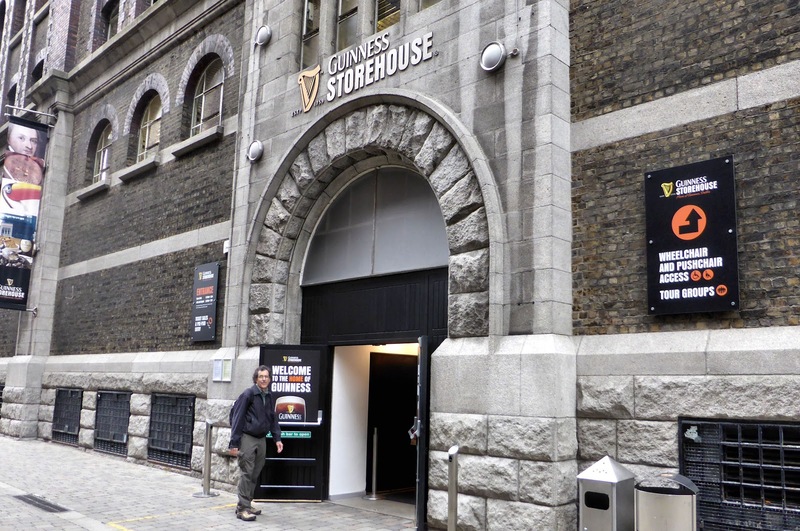 Various bars and restaurants on different levels of the storehouse will pour your pint, or you can learn to pour your own in the Guinness Academy. We opted for the top floor glass walled Gravity Bar with its expansive views over Dublin. As he dispensed a pint of the legendary stout, the barman explained how the addition of nitrogen at the tap and a two-step pouring process produces the creamy head on the pint. 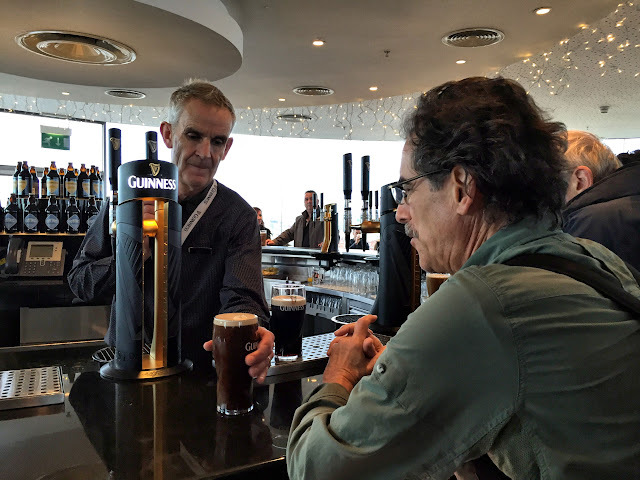 We didn't quite finish our pints, but did enjoy our visit to the Guinness Storehouse very much. By the time we left Guinness, we were ready to find some lunch and walked several blocks to the Brazen Head, which traces its history back to a coach house of the same name established on the spot in 1198. 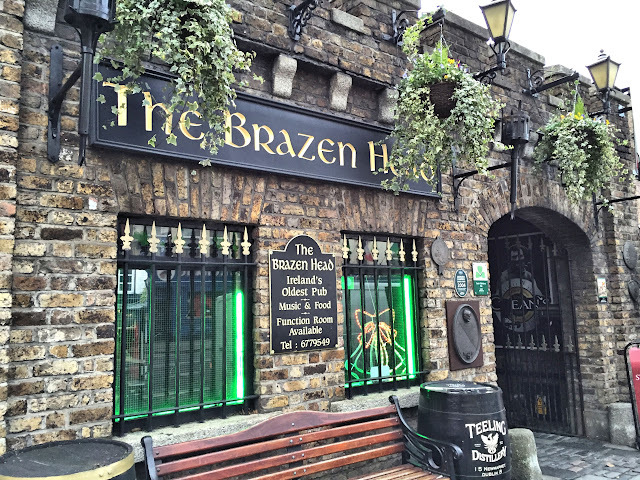 How much of the original structure remains—if any—is uncertain, but the Brazen Head holds the undisputed title of oldest pub in Ireland. As an added treat, their food incorporated fresh ingredients and interesting seasonings, raising it well above the usual pub grub. Winding up lunch a little after 4:00, we realized we hadn't enough time to walk almost two miles back to Kilmainham Jail in time for our 4:30 tour. A taxi seemed the obvious solution, but every cab that passed already had a fare. After five minutes of desperate scanning, we decided we'd better hot foot it back toward Kilmainham. Then the rain that is always just a cloud away in Ireland began to splatter down. Pulling the hood of my coat over my head to stay dry, I speedwalked right past an empty taxi parked outside a coffee shop on a side street we were cutting through. Fortunately Ken didn't miss it and even picked the driver out of the customers in the small shop. Hand signals through the window soon brought Paul out to the street, where he agreed to drive us to the jail. We even arrived in time to browse through the displays in the jail's small exhibit rooms before tour guide David rounded us all up to begin an enlightening lesson in Irish history. 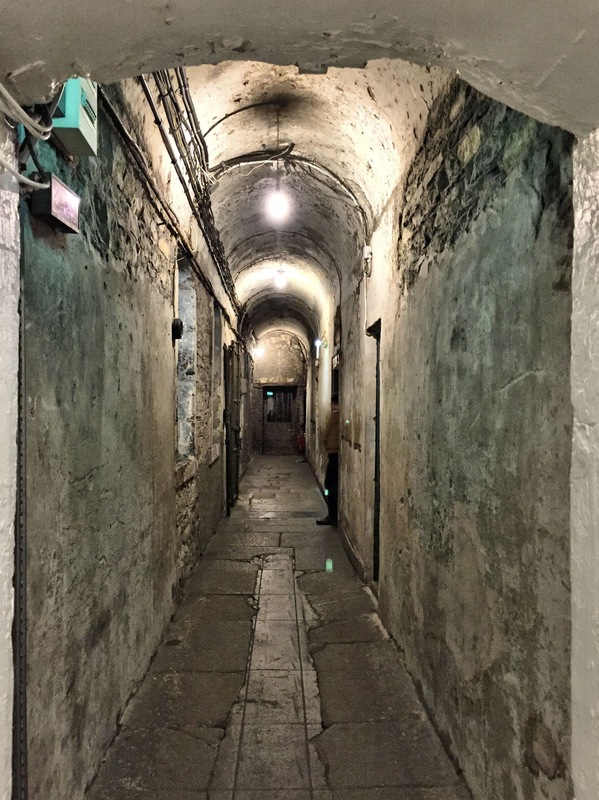 Built in 1796, the prison was used by the British to house men, women and children prisoners mixed together in dark and cold segregated cells. In that time period, children were considered responsible for their own actions by age seven and were often imprisoned for petty theft. Newer section of the prison built in the Victorian era allowed guards to observe all cells easily. 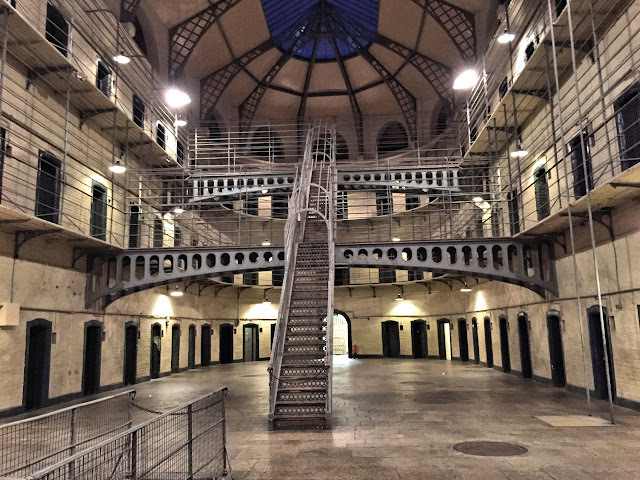 Before Kilmainham was decommissioned in 1924, shortly after the establishment of the Irish Republic, most of the Irish nationalist leaders from rebellions in 1798, 1803, 1848, 1867 and 1916 had been incarcerated at the prison. 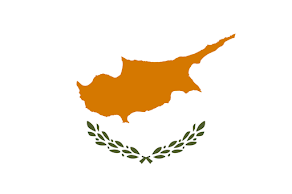 Many were also executed there. Perhaps the most poignant was James Connolly, leader of the 1916 Easter Rebellion. A longtime, ardent supporter of Irish independence from the British, Connolly was leader of the Dublin brigade in the uprising. After he was badly injured in the fighting, doctors declared Connolly had but a day or two to live, but that did not save him from capital punishment. After the other leaders of the rebellion had been executed by firing squad, Connolly was brought from the hospital on a stretcher. Unable to sit up, he was tied to a chair in the Kilmainham courtyard and shot. 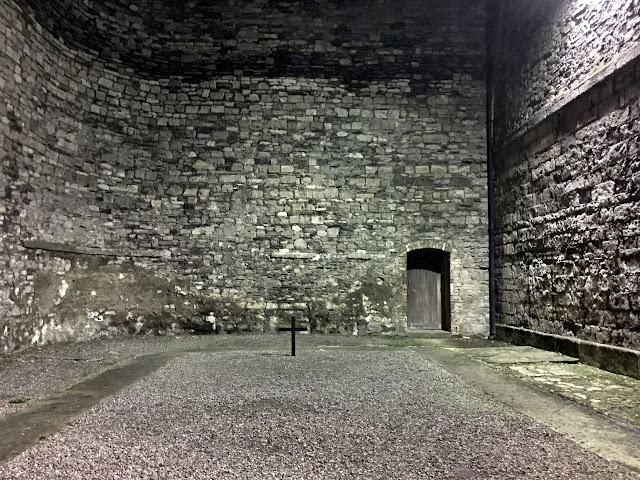 A cross marks the place in the stonebreakers' yard where 1916 leaders were executed. Well-schooled in the art of Irish storytelling, David could make his listeners picture the condemned men waiting for the executioners to fire. Though the area was lit, darkness overhead was thick by the time we walked through the stonebreakers' yard where Irish patriots were martyred for their people's freedom. The gloom fit the mood of the location well. Conveniently we had only to walk across the street to return to our hotel, where we ordered dinner from room service before strolling to a nearby Spar grocery store for a few supplies. 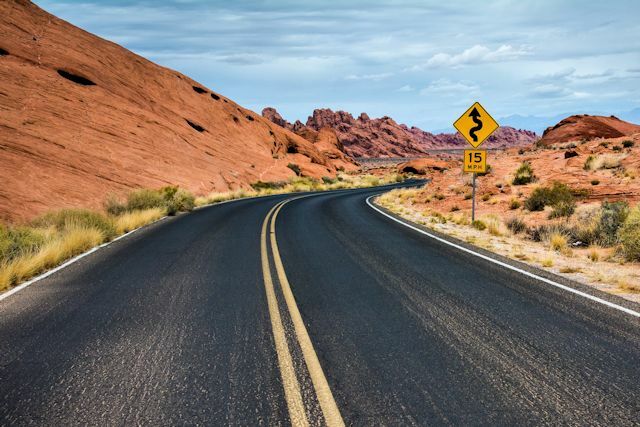 For tomorrow, the weather prognosticators have promised rain all day, so we'll have to be creative in our sightseeing. Though we have a car, parking in the city is extremely limited. 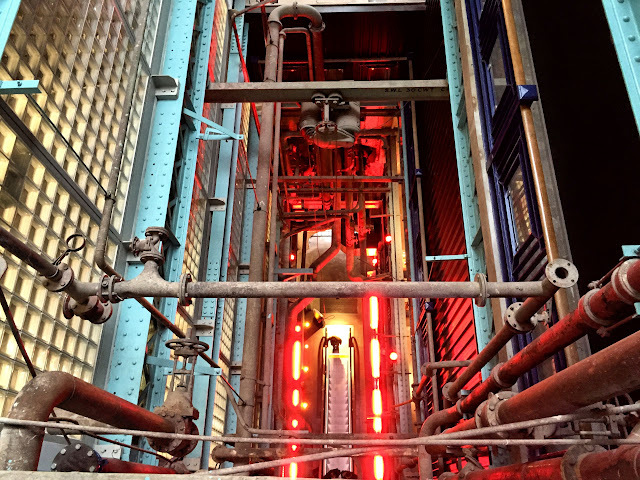 Holiday lights decorate the Guinness Storehouse. In earlier days, Guinness commissioned the construction of beer tankers to carry their product. 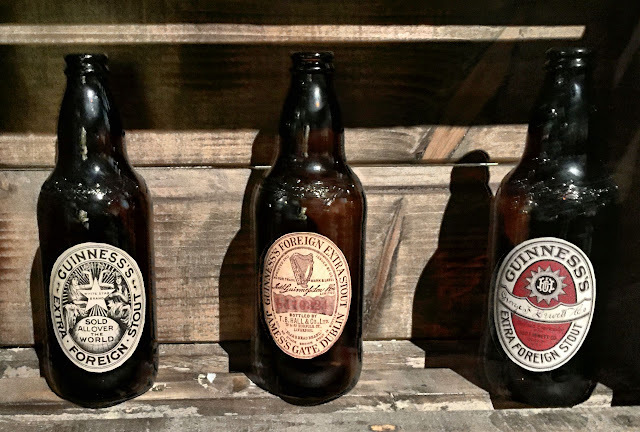 Early labels differed as Guinness was bottled where it was sold rather than at the brewery. 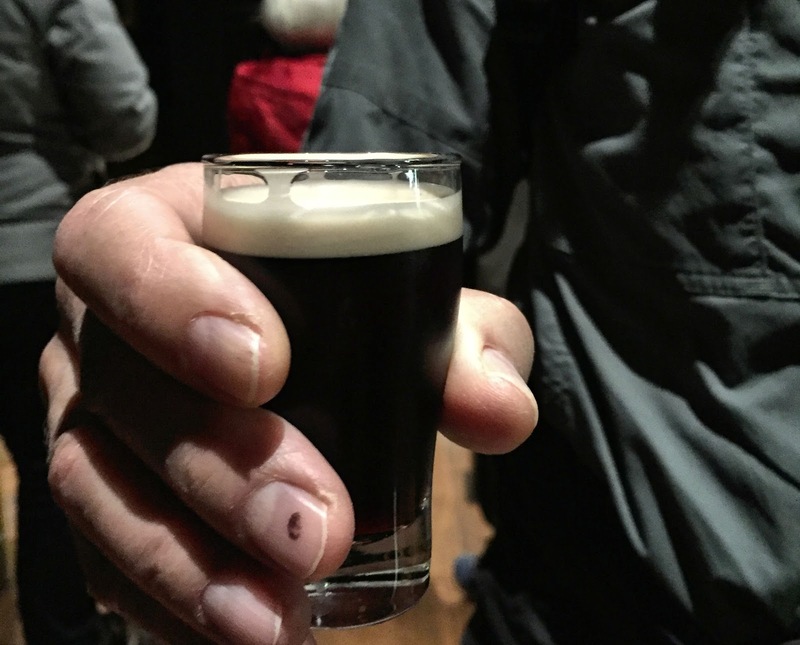 Perfect little miniature pint glasses for tasting.